It’s not often that a player is both arguably the third best left tackle in the league and also left off a Top 100 Players ranking. But that is exactly what Green Bay Packers left tackle David Bakhtiari is. The Pro Bowl tackle is entering his fifth year in 2017 after signing a contract extension with Green Bay which made him the fifth highest paid tackle in football. He was an integral part of an offensive line which protected the best quarterback in the land in 2016, and cemented himself as the best pure pass blocking tackle in the NFL. And yet, still, not included in the NFL Network’s Top 100 Players. Bakhtiari, and the rest of the offensive line elite, should be given their due. But, as longtime play-by-play announcer Al Michaels said during a recent broadcast, it’s hard for the run-of-the-mill football fan to understand an offensive lineman’s importance or skill. Once you turn on Bakhtiari’s tape, however, his skill is clearly evident. Being great in pass protection is an art form. It requires you to have the grace and balance of figure skater while also displaying the tenacity and relentlessness of a hard-nosed UFC champion. It isn’t easy, and most people in the world can’t do it. David Bakhtiari possesses these qualities, and displayed them all throughout 2016. During the Wild Card round last season, he matched up against a high quality defensive end in Olivier Vernon. They had a fun match up, but Bakhtiari graded out as the winner in my book. Here we see Bakhtiari remain patient both with his feet and his hands, allowing Vernon to come to him. Too often offensive tackles can get antsy, and lung at their targets. When a good pass rusher sees this, they can quickly swipe your hands and make you look foolish. Bakhtiari’s patience and hand-work is second to none in the NFL, and is on full display here. After making initial contact and keeping his hands inside, Bakhtiari allows Vernon to disengage. Vernon tries to work back to the inside and win with his speed, but Bakhtiari is too smooth in his footwork to let this happen. Pass blocking like this is exactly how Aaron Rodgers is able to sit comfortably and move around the pocket for so long every Sunday. David Bakhtiari is not only patient with his hands, but he also uses a variety of strikes when creating contact with pass rushers. Countless times defensive ends have disengaged, looking to swipe hands or hit a quick move, only to be met with another powerful strike in the chest. I also noticed that Bakhtiari uses his strong hands to create leverage and distance between himself and the pass rusher. He doesn’t allow them into his body, and very rarely allows for clean moves to be put on him. Another area in which Bakhtiari excels is with his feet. Against Atlanta here, Bakhtiari is met with a wide-nine technique. This is a tough block to make, especially considering the speed which Atlanta’s edge rushers possess. To combat this speed, Bakhtiari immediately flips his hips at the snap of the ball, and begins to get vertical. He does not over-set or get impatient, creating a point of attack where he and the defensive end will meet. Once they meet, Bakhtiari sinks his hips and sets his feet, allowing Rodgers time to get the pass away. What is most impressive about this rep is Bakhtiari’s ability to recover. Initially beat by the rush, Bakhtiari never panics. Instead he once again creates leverage with his punch and stops the rush before it’s too late. Patience, fluidity, and playing through the whistle. These three qualities jump out when watching Bakhtiari’s film from 2016. He trusts his technique, stays consistent in his pass sets, and is strong enough to blow back or redirect oncoming pass rushers. 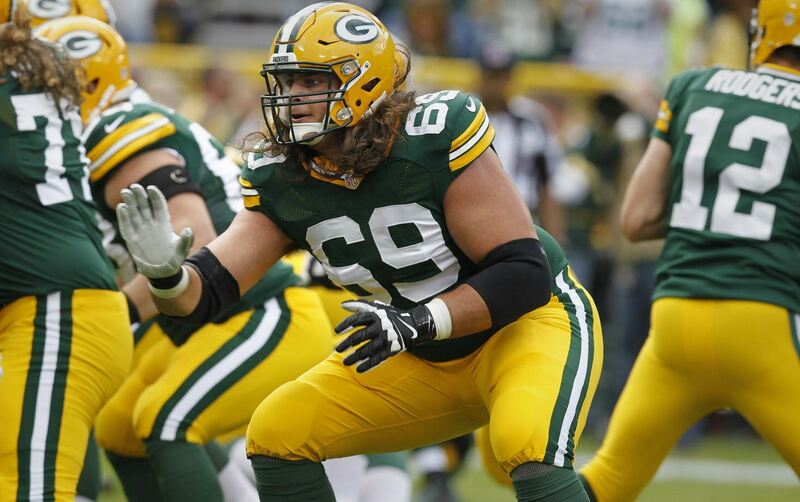 While I believe that Trent Williams and Tyron Smith are the best all-around offensive tackles in football, you will be hard-pressed to find a pure pass blocker better than Green Bay’s David Bakhtiari. So, in the end, he was right to be pissed off about being snubbed from the Top 100 Players, even if that list doesn’t mean a thing. Hopefully as he continues to dominate this season he will gain the respect which he deserves.